Increase sales and sign ups by learning exactly what to include on a high-converting services page. Download our ultimate services page copy template + full example. Are you wondering what could possibly be wrong with this? After all, isn’t having 25 years of experience a good thing? It is, but the way it’s framed doesn’t match what the firm’s potential customers care about. This may be hard to hear, but we’ve got to say it: your customers don’t care about your products, services, or brand. They want to know how you can help them solve a problem and make their life better. So instead of using your home page to talk about your brand, focus on the benefits your customers will experience if they buy from you or work with you (e.g., an affordable will drafted by a highly experienced lawyer). Especially when you’re first starting out, it can be tempting to cast your net wide. After all, you don’t want to miss out on a potential customer because your website copy didn’t target them. However, writing for a broad audience is another critical website copy mistake you can make. Why? Because if you try to write for too many audiences, your copy won’t resonate with anyone. Avoid making this website copy mistake by identifying your ideal customer and writing for him or her. For example, if you’re a photographer and you focus primarily on wedding photography, write your copy for engaged couples. Don’t try to write vague, generic prose that will also appeal to people who want family portraits and newborn photography. Have you ever visited a website with copy and images crammed into every square inch of the home page? What did it make you want to do? Stick around and explore or run for the hills? It’s important to give your website visitors the info they need to understand how they can benefit from your brand. But you don’t want to pack so much information into your copy that it overwhelms visitors. You also don’t want to have so many messages, images, buttons, and links on a page that it makes visitors confused about the action they should take. Avoid this website copy mistake by including only a single or select set of messages on each page and removing everything else that doesn’t need to be there. When you let people focus on a single message or single action you want them to take, you’ll increase the chance that they’ll actually do it. You may be an awesome creative writer, but writing for the web is different from writing a novel or poem. When people read website copy, they don’t start from the top of a page and work their way to the bottom. Instead, they scan pages for key information to decide if they should stick around. That’s why writing dense paragraphs of text is another key website copy mistake. Make your website copy scannable by throwing those weighty paragraphs out the window. Replace them with short paragraphs, headings, bullet points, and numbered lists. You can also use bold and italics to highlight information you don’t want people to miss. Another common website copy mistake is to assume that all of your website visitors will land on your home page and explore your other pages in a particular order. Remember, though, that a website isn’t a book that people read from beginning to end. Instead, people can enter your site on any page and move through your other pages in any order. This means that when you write copy for any website page, you can’t assume that the person reading it will know information you’ve provided on another page. Make sure each page can stand alone and give people the info they’re looking for. Although SEO is important, you never want to focus on it at the expense of compromising your visitors’ experience. Avoid writing unnatural or repetitive sentences just to get Google’s attention. And definitely don’t stuff your copy with keywords. Instead, focus on writing sentences that resonate with your ideal visitors and naturally incorporating your keywords into them. Every page on your website should have a clear call to action – copy that tells your visitors what you want them to do on that page. Note that there’s no standard call to action – it can be anything, including signing up for your email list, downloading a piece of content, or contacting you. One website copy mistake that you don’t want to make, though, is to forget to include a call to action altogether. As the owner of a website, it may seem obvious what your website visitors are supposed to do on each page. But that doesn’t mean that it’s obvious to them. Instead of making people guess what you want them to do, just tell them already! This one may seem obvious. But it’s amazing how easy it is to find grammar errors and typos on brand websites. Although these may seem like trivial website copy mistakes, they can have a big impact on the impression you make on visitors and how many of them you can turn into customers. In fact, a study by Global Lingo showed that 59% of website visitors won’t buy from a brand that has grammar mistakes on its website. Check your copy for pesky errors using these 7 proofreading strategies. And if you can afford it, hire a copyeditor. It isn’t hard to write copy for your website. But it is hard to write good copy, copy that catches people’s attention and clearly explains what you’re all about. 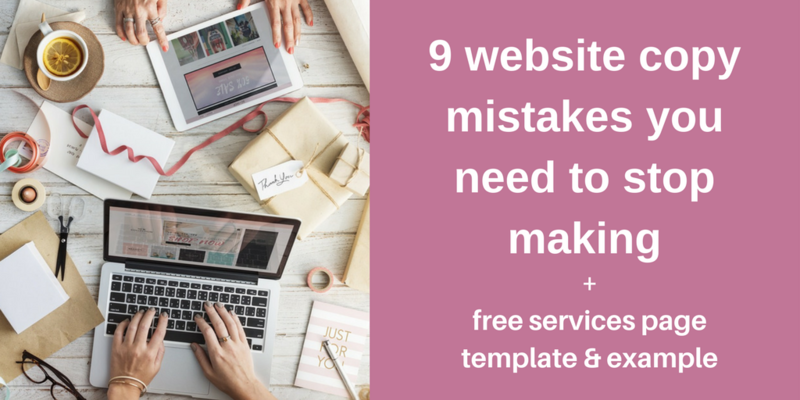 Boost the ability of your copy to turn website visitors into paying customers by checking it for these 9 website copy mistakes. Banish these mistakes from your copy to start a better conversation with your visitors today. ← Complacent vs. complaisant: What’s the difference?